[Limited edition for 2012 and 2013] Here we are just days away from our 4.5 year anniversary and I am starting up our 1000th post, how cool is that? I still cant believe I made it past 100, let alone to a 1000. 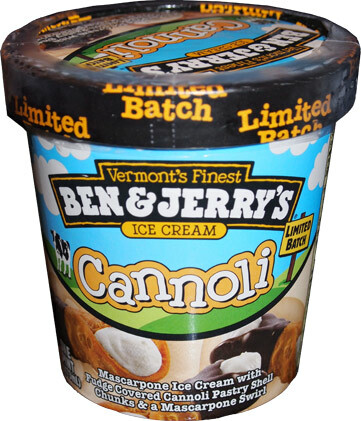 Good times had by all, so let's celebrate with one of the hardest to find pints of 2012, the limited batch Ben & Jerry's Cannoli Ice Cream. After weeks of searching, I finally found it! Why the excitement? Well, we've got Mascarpone Ice Cream with Fudge Covered Cannoli Pastry Shell Chunks & a Mascarpone Swirl. I really dug Perry's take on Cannolis and I'm hoping this is even better. The cannoli bits looks crunchy and very well coated though the swirl seems to be hiding except a small beige mark on the left side. I'm guessing we're not going to get a typical, ooey gooey, all encompassing swirl. You know, I've been waiting all day for this.... heck, since yesterday when I found this. Let's start with the base first. kinda cheesy (sorry, couldn't resist). The Perry's cannoli gelato was definitely a much more delicate flavor. What's really funny is that as I easily spoon the base, I kind of miss the little chocolate chips from the Perry's version. Let's get some shell bits on my spoon. Hmmm, not enough of them, let's get some real bits going on. There is definitely some crunch here and there --- ready, two chunks this time --- we've got varying degrees of crunchiness from kinda crunchy to fairly crunchy (no softies, but no hard crunches either). You know, there's not a ton of chocolate flavor popping through. I almost wish there were little soft fudge nuggets spread throughout to enhance the chocolate coating vibe. I think it's a lot like Late Night Snack where you need to have several fudgy bits first to build up a nice chocolate coating on the taste buds before you proceed. Ha! I just scooped some swirl. It's almost got a cookie dough consistency to it. Factor in that it's definitely not a strong flavor from the swirl and you realize it's a shame I cant find more of the it. I'm definitely settling into the flavor. I was worried it was a little too strong at first, but I'm doing just fine now. It's an easy scooping ice cream and I'm thinking it's going to be a half pint night. In fact, if I didn't know better, I swear Ben & Jerry's has tweaked their formula to make a smoother (more gelato like) texture on this one. It's not a bad thing at all, it suits the flavor, but something definitely feels different here. 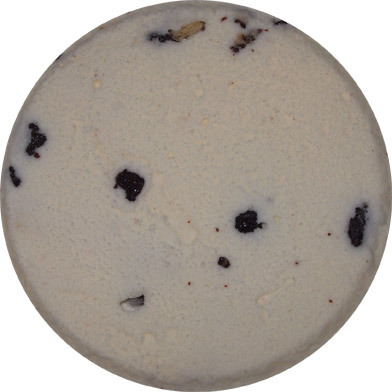 It's funny because with that texture change, there are times when the flavor almost strikes you as a really rich vanilla bean flavor. I guess my big thought here is that it's more of cannoli filling flavor then a straight up total cannoli package. The filling flavor is taking center stage while everything else is playing in the background. I know that all sounds like semantics, but since Ben & Jerry's is known for their mix-ins, I had hoped for a bit more in terms of shell flavoring. I guess it's one of those flavors where I wish there was two versions --- wait, awesome idea, next year's limited edition flavor should be Chocolate Cannoli, what do you think? So as I sit here with my lingering non-ricotta cannoli aftertaste, let me say that you're going to want to try this I think. As I've gotten more in the customer of cycling through flavors, it's pints like cannoli that mix things up and give me a break from chocolate, vanilla, and strawberry. So, unless you've really got a thing against cheese, then there's no reason not to add this to the list of flavors you've tried. On Second Scoop: I think there is a little bit of cheese shock for the first few bites, but it's one of those neat unique flavors where every bite inspires the next bite. That's the mark of a neat out-of-the-box flavor. I like it, I really do, and I think the key here would be to bring back this flavor every year in a new variety. For example, I was enjoying the second scooping and then it hit me, why not do like a cookie dough cannoli? It would be super unique and if it fails, hey, it's a limited batch, no worries. Is this anything like the volun tiramisu flavor? Where did you find this flavor? Thanks. I don't remember the mascarpone flavor really coming through on that one, but it definitely does here. My friend and I joined forces and vowed whoever found this flavor first to purchase it for both of us - she won :) I tried it last night and wow did it go down smooth for me! I liked that it wasn't as cheesy as their cheesecake line and definatly reminded me of the cannoli filling. Like you the fudge bits reminded me of Late Night Snack although I wasn't thirsty after eating this like I was with that one. Their was a serious lack of swirl but it definatly wasn't overpowering at all. Like you I thought the cookie dough or chocolate cannoli variety would be amazing! All in all I give it a 8 out of 10. It is like Voluntiramisu, but it's not half as good. Ironically I found it at Target and was debating - do i get the new flavor or go with tiramisu, one of my top 3 B&J flavors. Bottom line is Connoli is a totally uninspired creation, from the name to the taste. I really hope this one goes straight to the graveyard. I gave it 7.5/10, not enough swirl and that was the best part!! The reason why it tastes like a rich vanilla bean flavor is because vanilla bean seeds are used in the ingredients, as well as vanilla extract. I agree with you in that this is a nice change from vanilla based flavors. While it was really sweet, it was kind of boring. I didn't visually see or taste the mascarpone swirl but maybe the reason is because I had only a single serving and the swirl is in the center of the pint. Isn't mascarpone a type of cream cheese? I didn't taste a cream cheese flavoring or a cheesecake type of flavoring either, but more of a vanilla flavor as you also mentioned. I thought it was going to taste like Ben and Jerry's Cheesecake Brownie, but it didn't and I was glad since I didn't like it. Like last year's Rocky Roadish, this is a perfect limited batch because, although it's a nice change from vanilla and chocolate, I could not see myself buying this regularly. 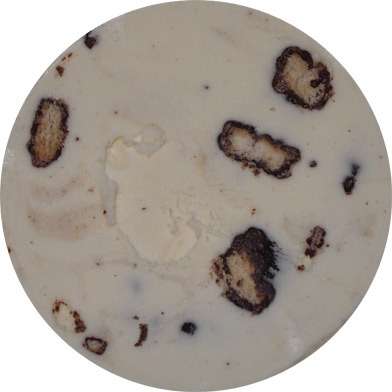 I am still waiting for the day when Ben and Jerry's experiments with a peanut butter cheesecake ice cream. After another night of eating this ice cream, I want to take back my previous review and say that this ice cream is delicious and addictive. On my second scoop, I noticed a slight buttery flavor that I didn't detect during my first scoop. Combined with the sweetness, I really enjoyed and appreciated the flavor this time around. The fudge covered cannoli pieces are numerous and complement the buttery sweetness. I will be sad when this flavor's life on the shelf runs out. Every one needs to try this one.